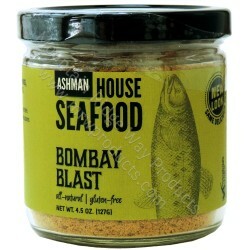 An Indian cuisine inspired style spice rub and seasoning. Try it on your favorite fish and also on chicken. A balanced spice mix including: coriander, ginger, black pepper, red pepper, cumin, cinnamon, mace, thyme, celery seed and a bit of brown sugar for caramelizing. Great on salmon, tuna, striped bass, grouper, mahi-mahi, and scallops! Give it a try in a on chicken and pork! 4.5 oz nt wt Jar. Gluten Free.